This abstract was presented today, May 8th at the 2017 Association for Research in Vision and Opthalmology (ARVO) meetings in Baltimore, Maryland by Andrea Bordt, Diego Perez, Robert E. Marc, James R. Anderson, Carl B. Watt, Bryan W. Jones, Crystal Sigulinsky, James S. Lauritzen, Danny Emrich, Noah Nelson, Luke Tseng, Weiley Liu, and David W. Marshak. Full resolution version here. Purpose: There are at least 30 distinct types of mammalian retinal ganglion cells, each sensitive to different features of the visual environment, and these can be grouped according to their morphology. One such group, the gamma cells, was identified more than 40 years ago, but their synaptic inputs have never been described. That was the goal of this study. 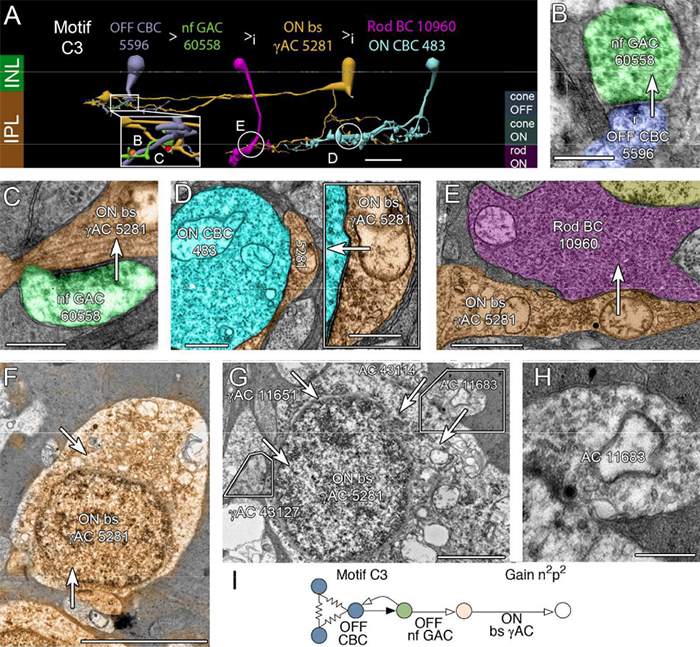 Methods: The synaptic inputs to a subtype of gamma cell with dendrites ramifying in the outer sublamina of the inner plexiform layer (IPL) of the rabbit retina were identified in a retinal connectome developed using automated transmission electron microscopy. Results: The gamma cell was always postsynaptic in the IPL, confirming its identity as a ganglion cell. The local synaptic input should produce relatively weak OFF reposnses to stimuli confined to the center of the gamma cell’s receptive field. It typically received only one synapse per bipolar cell from at least 4 types of OFF bipolar cells. Because bipolar cells vary in their response kinetics and contrast sensitivity. each type would provide a small, asynchronous excitatory input. The amacrine cells at the dyad synapses provided only a small amount presynaptic inhibition; reciprocal synapses were observed in only 3 of the 18 ribbon synapses. There was no glycinergic crossover inhibition, another local interaction that would enhance light responses. Local postsynaptic inhibition was somewhat more common; in 6 instances, the bipolar cells presynaptic to the gamma cell or their electrically coupled neighbors also provided input to an amacrine cell that inhibited the gamma cell. The other amacrine cell inputs to the gamma cell should have a much greater impact on the light responses because they are far more numerous. These are from axons and long dendrites of GABAergic amacrine cells, and they provide 60% of all the input. This finding suggests that many types of stimuli in the receptive field surround or outside of the classical receptive field would provide potent inhibition to the gamma cell. 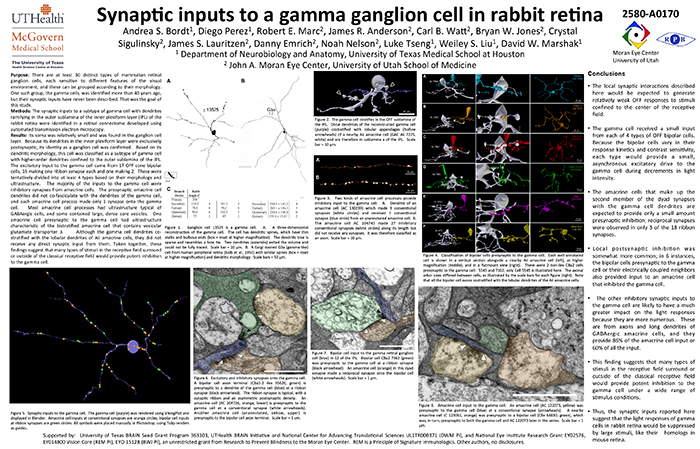 Conclusions: The synaptic inputs rsuggest that gamma cells in rabbit retina would have light responses like their homologs in mouse retina, OFF responses to small stimuli in the receptive field center that are suppressed by a variety of larger stimuli. Thus, they would signal object motion selectively. This entry was posted in Abstracts and tagged Andrea Bordt, ARVO, ARVO 2017, Bryan Jones, Bryan W. Jones, Bryan William Jones, BWJones, Carl B. Watt, Crystal Sigulinsky, Danny Emrich, David W. Marshak, Diego Perez, James R. Anderson, James S. Lauritzen, Luke Tseng, Noah Nelson, Robert E. Marc, Weiley Liu on May 10, 2017 by bwjones.